Three prizes (1500-1000-500 GBP) in the Open section for players who didn't win a higher regular/rating prize in the tournament. The prizes will not be tied, and will be awarded to the three highest ranked ACP Premium Members, who haven't won a higher regular/rating prize. Three prizes for women (1000-600-400 GBP) for the top three highest ranked ACP Premium Members. These prizes are compatible with the regular/special prizes in the tournament. 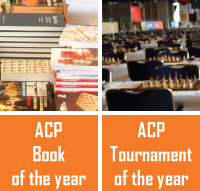 These special ACP prizes will not be tied. Eligibility - the players must be actual ACP Premium Members before October 21, 2018.